The Hammer Web Tour Edition gives a silky smooth reaction by combining the TourV1 coverstock with a modified Spheroid core. The TourV1 coverstock has been researched, tested, and tweaked to develop the most forgiving coverstock that Hammer has offered to date. The original Spheroild core has been modified to have less flare and more control. This ball has been designed to create a strong midlane reaction with a continuous backend on medium oil conditions. This bowling ball is Carbon Fiber Infused! Carbon fiber is one of the toughest materials on earth. Hammer decided to add this material to the inner core of this ball for added strength and durability allowing them to offer an incredible 3 year warranty. Type : THS so far. The Hammer Web Tour is a must for all tournament bowlers. This ball will give you a smooth reaction off the spot, but will not quit. I have been able to use this on a variety of patterns (sport and house). As mentioned in another post, this will be a great bench mark ball in your arsenal. Also, don't let the box surface scare you. Try it out, and you will not be disappointed. The TourV1 Solid coverstock is very forgiving! Make the investment! The Web Tour is something special. Hammer really did a great job in coming up with this tour design. The ball is extremely smooth but carries really, really well. Got nothing but good comments from people watching me throw this piece. 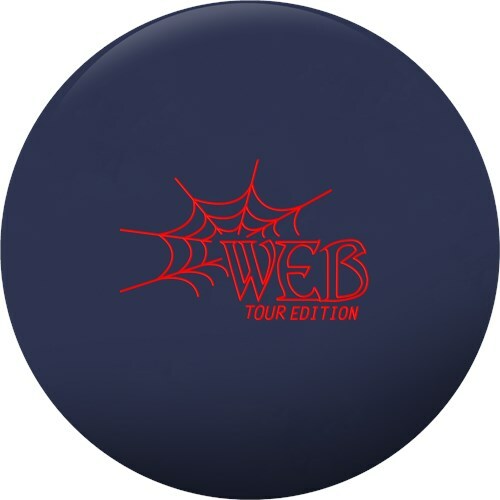 Anyone that is creating an arsenal should consider the Web Tour as their first ball in the bag. This will be your benchmark in all league and tournament conditions. Likes: This ball for me is awesome. I listened to all the information and wanted to make it different than my Web. I put the pin under because the ball was already characterized as earlier than the Web and smoother. Boy howdy - You got than right! This ball is so smooth but aggressive. Keeps the pins low for me and I love how subtle it is in reaction but how strong it is at the same time. The smoothness makes it very predictable and I know I can see the same shape as my Web but earlier and smoother when I want to blend out the pattern. Great piece for any bowler. May sound cliche, but the Hammer Web Tour is a must have in your arsenal! The ever forgiving ball will help you strike even if you miss left or right! The Web Tour has a smooth controllable backend reaction that still crushes the pins upon contact! Although this is a recommended medium oil lane condition ball, even on the lightest of conditions you can have success if you are comfortable swinging the ball! Depending on your arsenal, this could be your new BENCHMARK ball! Definitely a great ball and must have for all style of bowlers! I know, yawn, another staffer posting about how great a ball by their manufacturer is. But this thing is the REAL DEAL. I may have had a similar release to the Web Tour in my past, and I have to say I didn't throw that ball nearly as much as I have as the Web Tour. This thing is special. I went with my low flare layout of 50 by 5 by 80, which keeps the flare rings very close together on this ball. This ball out shapes my Game Breaker 3, but still can generate so much entry angle. This ball is slow off the spot, but so very receptive to what I am trying to do with my release. In one of the leagues I bowl, we are bowling on a 37 ft, 29.25mL, 4.63:1 ratio pattern on a very high friction lane surface. I keep this ball at 2000 grit, but it honestly looks a little higher grit than that (I haven't laser scanned it, but will soon). It is a little too soft off the spot for the fresh on this pattern, but after the friction at the first arrow becomes more defined, I have no qualms switching right into this ball. I've had a lot of success with this ball in so many different environments. The predictable nature of this ball doesn't have my ball motion tangled up. The Web Tour is a growing favorite. (Quote) I know, yawn, another staffer posting about how great a ball by their manufacturer is. (Unquote) You're spot on with your opinion here. Likes: I used Dual Layout 55 x 5 x 35 Pin up no hole. This ball is like Urethane with smooth through the fronts and nice continuous motion on the back end. Great for Fresh shot for the fresh. Page created in 0.676 seconds with 22 queries.